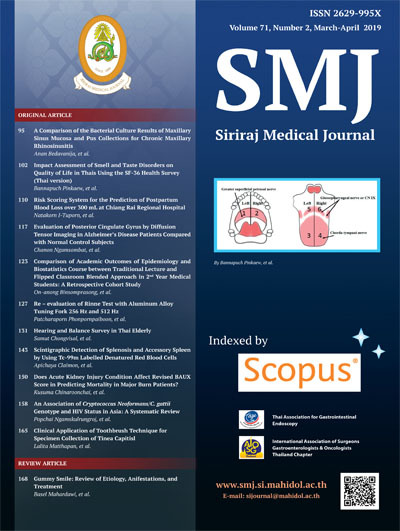 The Siriraj Medical Journal (SMJ) aims to promote communication among researchers in health sciences. It is published bimonthly and accepts the manuscripts in the forms of the original article, review article and letter to the editor. It is academically double-blinded peer-reviewed and designed for all physicians, researchers, and health personnel, regardless of their specialties. The SMJ is indexed in the national and international database for journals. It is indexed in Scopus, the Tier 1 database of the Thailand Citation Index Center (TCI), the ASEAN Citation Index (ACI) and also included in the Directory of Open Access Journal.